Cynthia Dill represents clients in federal and state courts, in the media and before government agencies. She also writes punchy political commentary, produces a podcast, and appears regularly on television and radio as a trusted news analyst. 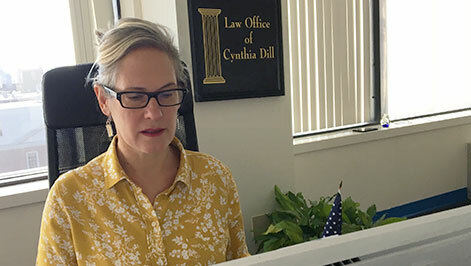 The Law Office of Cynthia Dill is a sophisticated small firm that mostly litigates complex civil cases in federal court and provides sound government and media relations for individuals and organizations. Cynthia is an analytical thinker and leads public discourse about politics and justice by helping audiences understand what’s at stake and why. Research and facts come before her opinions that are expressed with confidence and humor. In print, online and broadcast live on radio and television, Cynthia is a trusted commentator and credible analyst of the news who informs with accuracy and intellectual fairness.